Every time you choose SPLENDA® Sweeteners instead of sugar, you’re making a simple step that can make a difference. That’s because SPLENDA® Sweetener has just a fraction of the calories of sugar for the same great taste. SPLENDA® Brand Sweetener (sucralose) is different: it’s* made from sugar, tastes like sugar, but it’s not sugar! You’ve probably heard lots of statements about sugar and sweeteners before and it’s hard to know what to believe. 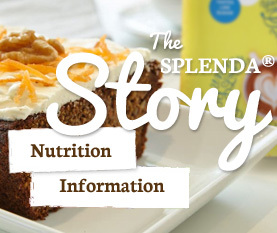 Discover the truth behind some of the most common myths about sugar and sugar alternatives, revealed by SPLENDA®’s consultant Dietician, Helen Bond. The video features 14 questions and answers. Challenge yourself by pausing the video after each question to answer for yourself first. Then see if you knew the right answer!